Come and paint en plein air in the warmth of the Tuscan sun in Cortona, one of the oldest and most beautiful cities in Tuscany! Discover the effects of light in painting the beautiful countryside around Cortona en plein air. 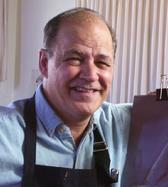 William (Bill) Rogers will demonstrate in both the oil and watercolor mediums. He will help painters of all levels develop a more acute sense of observation as well as learn techniques to simplify and translate their observations into paint. Bill will start each onsite session with a different problem to resolve and will do a small demo to illustrate possible solutions. This will be followed by students working on their own projects while Bill circulates with a clipboard and a painting surface to show students, with mini side demos, particular strategies for their unique painting- such as colour mixing, paint handling, drawing, and composition. Bill will have a couple of in depth critiques over the week so students can benefit from each others struggles and solutions. They will also benefit from the instructor’s many years of teaching workshops from which he has garnered proven and effective strategies for helping students to paint successfully. among the sights and sounds of beautiful and romantic Tuscany: olive groves, vineyards, centuries-old buildings, winding streets, texture and vibrant sunlight. in the warm ambiance of Cortona, overlooking Lake Trasimeno and the Val di Chiana, originally fortified by the Umbrians, claimed by the Etruscans, touched by the Renaissance, almost unchanged for centuries, one of Tuscany's jewels. the joy of en plein air in a relaxed and inspiring atmosphere with the expert instruction of a nationally known artist and instructor and the camaraderie of a small group of learners. great Italian food, delightful wines, new friends, breath-taking vistas, history and the hospitality of the people of Cortona. View Bill on You Tube! Group Meal Plan...US$3290.00 per person! ’Aquarelle (SCA). Most of his landscapes are done “Plein-air”, which he feels is the key to accurately capturing light and its effects. He has exhibited in many international watercolor society competitions all over North America and has been the recipient of many awards, including the AJ Casson Medal at the 2009 CSPWC Open Water Exhibition in Calgary. Bill has extensive teaching experience, including teaching Art part time at St Francis Xavier University as well as many workshops in Canada and abroad. He paints the model from life at least once a week besides his landscapes and other subjects such as horses - a passion for him. please visit his website at www.williamrogersart.com . **Included with "Hotel" plans only. See details. ***Included with "Group Meal Plan" only. See details. 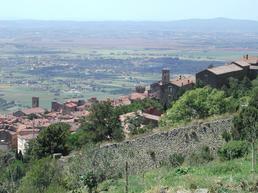 Air travel to/from Cortona is not included and is the responsibility of each participant. -6:30p Welcome to Cortona wine and chocolate tasting at La Saletta. Note: Toscana Americana reserves the right to alter this itinerary. All times are approximate. Note: Transfers are provided only for programmed meals and activities away from the hotel. Note: All guests are responsible for handling their own luggage/baggage....we suggest to pack light. Note: No refunds are given for any unused aspects of the itinerary or for any activities outside the above itinerary. strip off type or wooden palette or masonite. Glass or plexi is also good if you have a table to lay it out on. For this workshop Walnut oil or walnut alkyd medium. : Canvas panels or stretched canvas, or primed masonite panels. Charcoal pencil or vine charcoal stick. (A basic list of a few essential materials) email me at billrogers@eastlink.ca or phone (902) 863-6797 with any questions. I will be most happy to help. – professional grade WC paint e.g. Holbein, Windsor Newton, Daler Rowney, DaVinci, etc. Tube Colors – cad. Red, alizarin crimson, ultramarine blue, cobalt blue, cerulean blue, lemon yellow or cad. Yellow pale, gamboge or cad. Yellow deep, viridian green or pthalo green; sap green, raw sienna, Burnt sienna. Note: this palette is mainly a warm and a cool yellow, a warm and a cool blue, a warm and a cool red, and a secondary green, and a couple of earth colors – no black. White is sometimes useful if not overused. Any palette (selection of colors) which works on this theory is fine. –You may like a John Pike palette (plastic) or equivalent. A large dinner plate is great, also an enameled tray or folding palette. – any simple containers, even empty yogurt or ice cream containers, and also plastic beer cups will do. and others you can’t do without, bigger for bigger paintings. I have a lot of brushes such as 2” flat wash and nos. 14,16,24 rounds for when I work larger but you should have the first 4 brushes mentioned at least. – 22”x30” sheets of 100% cotton paper of your preference such as Waterford, Arches, Fabriano, Windsor Newton etc. 140lb or300lb – have 3 or 4 sheets which may be subdivided. I always like to have more than I need so I’m not afraid to make a mistake. – such as Masonite, thin plywood, foamcore (2 ply glued). I like mine cut 1” larger than paper I’m using. e.g. 12”x16” board for 11”x15” w.c. paper (quarter sheet) 16”x23” board for half sheet, or 23”x31” board for full sheet and this can also be used for in between sizes. Most students work half sheet or less. : Recommend that you bring an outdoor easel such as French easel or WC easel. Some students improvise (lawn chairs, lap etc.). Paper towel and Kleenex, masking tape (alternative to clips), Sketchbook (inexpensive) for composition, box cutter or pencil sharpener, Frisket if you like it. Hat and/or sunscreen. (Miami University BA'80, MA'82) lives in Cortona where he continues a thirty-year career in the field of Arts & Entertainment producing events, workshops and tours and providing opportunities to share the Italy experience with travelers, artists and people who share his interests for foods, wine, art, culture. Patrick's passion is to conceive and realize various ways in which the human spirit can express and demonstrate its capacity to create. His ability to fearlessly think, conceive, and work "out of the box" has earned him the attention of artists & musicians, colleges & universities, public & private organizations, and business and industry. Patrick brings integrity and a unique vision to Toscana Americana and he is committed to realizing the opportunity for participants to create in an atmosphere of peace, joy, respect and mutual support. As a "slow traveler" and a supporter of "slow food" Mr. Mahoney rides trains, walks, lingers over lunch, dinner or a cup of espresso, stops to smell the roses and savors the sensory feast wherever he is!